Many people just visit in Nepal for Tiji (Tenchi) festival which is a three –day ritual celebrated in the parched land of upper Mustang (Lo Manthang). Mustang Tiji festival is well known as “The chasing of the demons” clusters on the Tiji myth. Tiji tells the story of a deity named Dorje Jono who must battle against his demon father to save the Kingdom of Mustang from destruction. The demon father wreaks havoc on Mustang by creating a water shortage which, in this extremely arid land, is the most precious life-sustaining resource. Dorje Jono eventually defeats the demon and banishes him from the land. 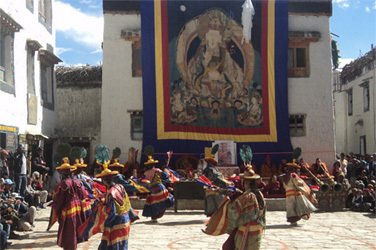 Tiji festival is celebrated to invoke the mighty Dorje Jono to remove any obstacle out of the way. 30 May 2019: Day 8: Trek from Drakmar to Lo-Manthang 3810m/7-8 hours via Ghar Gompa and Marang-La Pass.